Two home runs by sophomore catcher Mike Zunino, including a three-run game-winning shot in the sixth inning, powered No. 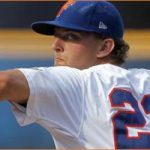 4 Florida Gators baseball (40-13, 21-7 SEC) over the Kentucky Wildcats (24-29, 7-21 SEC) 9-6 Thursday, giving the team sole possession of first place in the Southeastern Conference standings. Zunino (3-4, 2 HR, 5 RBI, 2 R, BB) has now connected on five home runs in the last three games and boasts a team-high 15 dingers on the season. After a scoreless first frame at McKethan Stadium in Gainesville, FL, Florida’s offense got going in the bottom of the second inning on three consecutive RBI including singles from redshirt sophomore designated hitter Vickash Ramjit (1-3, RBI, 2 R) and senior center fielder Bryson Smith (2-3, RBI, 2 R) and a sacrifice fly by sophomore shortstop Nolan Fontana (1-3, 2 RBI). Kentucky did not waste much time eliminating their deficit, scoring four runs off of sophomore left-handed pitcher Brian Johnson in the top of the third to jump ahead 4-3. With the bases loaded and no men out, left fielder Chad Wright tripled to right field. A single by the next batter, third baseman Thomas McCarthy, brought Wright home to give the Wildcats the advantage. The Gators responded immediately as Zunino took the first pitch in the bottom of the inning over the wall in left center to tie the game 4-4. McCarthy tripled down the left field line to start the sixth and scored on a sacrifice fly on the next play to put Kentucky ahead 5-4. Zunino answered for Florida by smacking his second homer on a full count in the bottom of the inning to give the Gators a 7-5 lead. With Johnson (8-3) out of the game after giving up four earned runs on seven hits with six strikeouts in six innings, junior right-handed pitcher Greg Larson took over in the seventh and allowed an unearned run after two errors helped SS Taylor Black to reach base and advance to second; he was singled home by McCarthy. Only up one run, Florida put the game away in the bottom of the eighth, rallying for two more scores off RBI singles from Fontana and Zunino. Sophomore RHP Austin Maddox came on to toss a hitless ninth, sending the Gators to victory with his third save on the year. Florida’s 40th win of the season, combined with series-opening losses by No. 2 South Carolina (which fell 2-1 to Alabama) and No. 3 Vanderbilt (which dropped a 5-4 contest to Georgia), puts them a game ahead of their SEC East rivals. All three teams were previously tied with a 20-7 conference record. 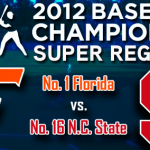 A victory Friday would clinch at least a share of the 2011 SEC regular season title for the Gators.